Philips Lifeline required a platform on which its employees could access the appropriate plan details quickly and easily. "RockDove Solutions' In Case of Crisis app is putting the information our employees need to have on their smartphones." Philips Lifeline is a division of Philips Corporation’s Population Health Management. It is the industry leader in providing aging-in-place solutions—supporting independent living and helping older Americans make the transition from hospital to home and is the industry leader in fall detection, with hundreds of thousands of customers in the United States and throughout the world. 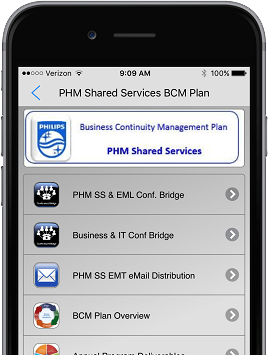 Philips Lifeline had business continuity, disaster recovery, and EHS plans, but none were in a central location and easily accessible. Though the electronic version of its plans were stored in SharePoint, many members of the incident response teams were still using binders that they kept at their desks or in their cars. Desk cards were used for employee EHS plans, but those were difficult to update and often were an afterthought. 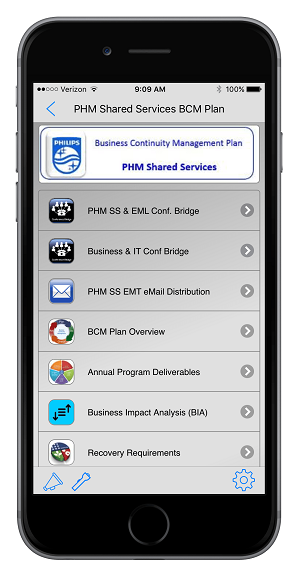 Besides SharePoint, Philips Lifeline is using Everbridge to communicate during crises. Though this accomplished Stearns’ communication goals, the plans themselves were still not as accessible as needed, and they were unwieldy. A 500-page business continuity plan printed out for 50 people required a major effort simply to print updates. Stearns estimates the company was spending $11,000 a year just to update plans. “Having a paper-driven system is the dark ages for BC,” he said. SharePoint wasn’t perfect, either. It always required Internet access—not always an option if the power is out from a snowstorm that is not unusual in the Northeast—and still housed giant files that would need to be searched for the precise information needed. Stearns decided Philips Lifeline needed something easier to use and more accessible, yet also advanced in options so that employees could handle any crisis with speed and accuracy. At first he investigated business continuity development tools but found many were not truly client-based—information could be entered into the application, but end-users didn’t get much from it. Then, Stearns discovered the In Case of Crisis app from RockDove Solutions. Stearns’ goal was clear: Provide better accessibility, not only for the business continuity and disaster recovery plans that were so important to continue operations in the event of a crisis, but also for EHS plans that better protected employees if an emergency occurred. In Case of Crisis was able to help in each of these areas. For business continuity and disaster recovery, RockDove Solutions’ application instantly gave Philips Lifeline a more reliable option than the bulky binders. Stearns published plans within the application, thus putting important information directly at the fingertips of crisis management teams. When a crisis occurs, execs just tap on an icon to call up the crisis management plan instructions, access plan information on SharePoint, email key coworkers, or start a conference call. For EHS, Stearns created a “What to Do If” plan using the RockDove Solutions app. It includes basic information such as what to do when there is a medical emergency, how to use a portable defibrillator, building evacuation routes, what do to if someone is in the building not wearing an employee or visitor badge, and so on. The app uses different icons based on things that drive employee behavior—from evacuations to sheltering employees to lockdowns. "The plan updates are quick and are shared automatically within a couple of seconds of the update, but it's always on their smartphones. That's a win-win." The members of Philips Lifeline’s incident management teams immediately embraced the RockDove Solutions platform when it was rolled out to them. Philips Lifeline has experienced a couple storms and IT events that have already necessitated the app’s use. 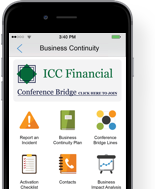 Senior managers have said they love the In Case of Crisis app, which has worked well in getting them into the conference call bridges. Stearns is now rolling out the EHS plan to the rest of Philips Lifeline’s approximately 800 employees at its Framingham headquarters. This will give the employees better access to updated emergency information—a big improvement over the laminated cards previously in use.